Have you ever met two people and instantly felt a connection? There’s no doubt that’s how I felt about Jason and Dave. They are creative, passionate humans and are so full of such beautiful wisdom and knowledge. Not to mention they are head over heels for each other, it was so refreshing to be around them and their love. Both of them are huge supporters of their local community in Lancaster and really wanted to do their photos in the place that they love and call home, so that’s just what we did. They took me to Alley Park in Lancaster, Ohio. 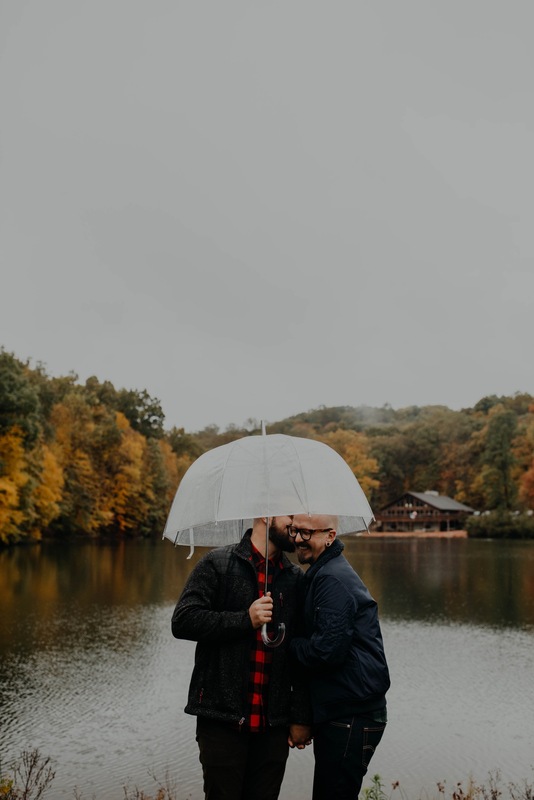 It was a rainy, cloudy and cold day but the fall colors were in full explosion and the rain just brought them out even more. I personally think it’s always a good idea to brave the rain for photos! We had so much fun running around the park taking their engagement photos, I wish every day was like this one!